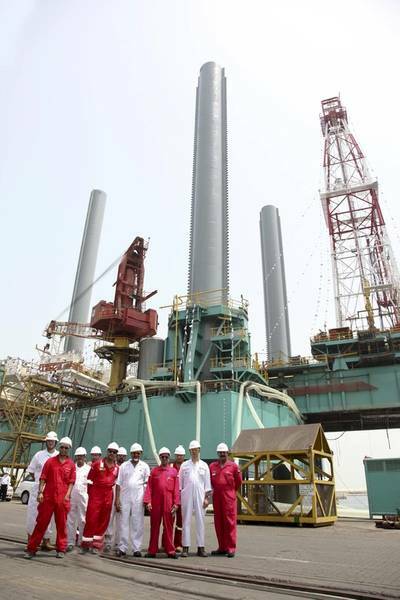 Drydocks World, announced the completion of maintenance work on Abu Dhabi-UAE based National Drilling Company’s (NDC) Jack-Up Cantilever type Self Elevating Drilling Platform, Delma, which was built in Brazil in 1983. Drydocks World has repaired over a 100 rigs since operations began and has implemented more projects for the offshore drilling sector in recent years as part of a deliberate strategy to serve this rapidly growing sector. The shipyard had worked on 6 rigs simultaneously this year. Delma is the first of two orders received from NDC this year. “We are extremely delighted to have completed yet another challenging project for NDC. We have developed our business strategy around the offshore oil and gas industry as we see definite long-term growth prospects in this field due to continued offshore exploration and development. Drilling rigs with enhanced capabilities are a prerequisite as search for new hydrocarbon reserves reach deeper and harsher waters,” said Khamis Juma Buamim, Chairman of Drydocks World and Maritime World. The scope of work consisted of complete overhaul of Starboard crane and overhaul of Port Side crane, steel renewal in tanks, improving high pressure mud lines and stand pipe manifold and various pipes. The pipe lines were hydro jetted and the rig was blasted and painted. The internal rig inspection, painting of legs and derrick was carried out using rope access. Upgrade of the rig in addition to regular maintenance included replacement of two life boats and davits and shale shakers, fabrication and installation of BOP trolley beam and renewal of grass hopper cable trays.